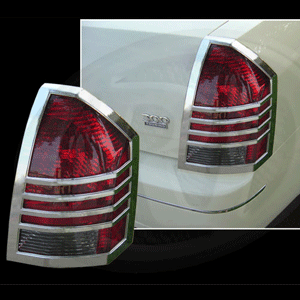 * Chrome Finish Innovative Bold Styling: Brighten up the exterior of your car with these Chrome Tail Lights Bezels for your Chrysler 300. Installs in minutes by simply lining up the bezel and removing 3m adhesive backing. Quality Construction: No one gives you the bold clean styling of our Aftermarket Dress Ups, Suspension and Performance Parts for your American Muscle Car like UPR Products! Installs in 5 minutes or less. Fits these Vehicles: 2005 2006 2007 2008 2009 Chrysler 300 SRT8 Vehicles. Made in the USA!